Roast club vibes were strong, and my friends had been watching Masterchef. It's quite the combination. Someone made cinnamon buns, and the cravings were real. I was promptly challenged to a cinnamon roll bundt. Now, in the interest of never making the same cake twice (and full transparency), some of you may recall a similar cake a few Christmases ago. This was going to be different. The NutriBullet was out, and full on bundt witchcraft commenced. This wasn't going to be a cinnamon flavoured cake. I wanted it to be a cake, but taste like the breaded variety. The only way to achieve this is by putting the yeasted items in the cake. It works. The icing is excellent too! This is the best version of about five American recipes I mashed together, then tinkered with as a I made it. The browned butter makes all the difference. This is a trick I got from a friend who's a chef. Trust us. Give this one a go over the colder months for instantly warmer cockles! 1 shop bought cinnamon bun (optional), whizzed to crumbs in a food processor. Grease and flour an average sized bundt tin of 10 cups/10 inch diameter or 2.4 litre capacity. Sift in 1/3 of the dry ingredients, followed by 1/2 of the yoghurt. Repeat until all the flour and yoghurt is used up. Fold in the cinnamon bun crumbs. Pour half the mix into a greased and floured tin, sprinkle over the demerara sugar mix, then top with the rest of the standard mix. To make the cream cheese frosting, first melt the butter over a gentle heat until it starts to brown slightly. Meanwhile, whip the cream cheese with the vanilla extract until smooth. Carefully pour in the melted butter, being extra careful as it is well hot! Add the icing sugar a bit at a time, therefore avoiding a sugar style mushroom cloud. This is the variable bit. You want your icing to be spreadable, but not runny. Just add enough milk to achieve that consistency. Spread over the cake. 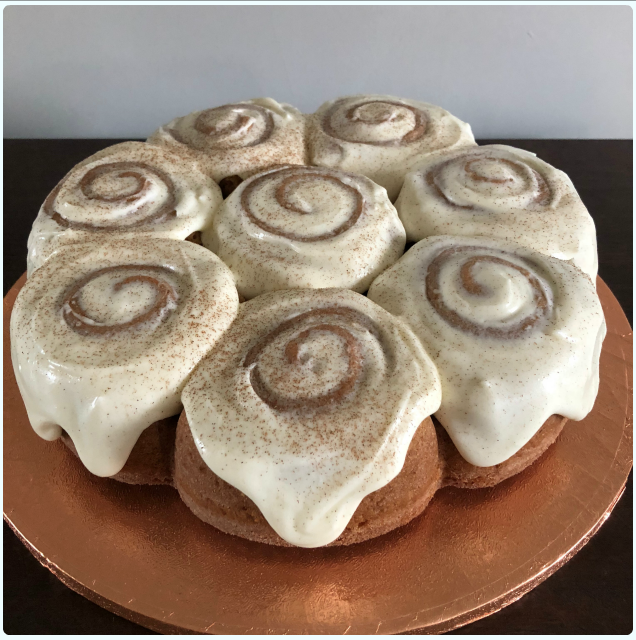 If you are using the cinnamon bun tin, I found swirling over the shape of the buns with a teaspoon revealed the pretty design underneath. It works just as well on a standard bundt though. Sprinkle with a little cinnamon. Writers/Bakers: Please respect the fact I am sharing my own ideas and basic recipe. Blood, sweat and many tears have gone into getting this right, so you may enjoy a perfect bundt. If you wish to re-blog a recipe from these variations, please credit my blog and link to this original post rather than pasting the recipe on your own page. Please see my Creative Commons Copyright information for more details. Thank you.